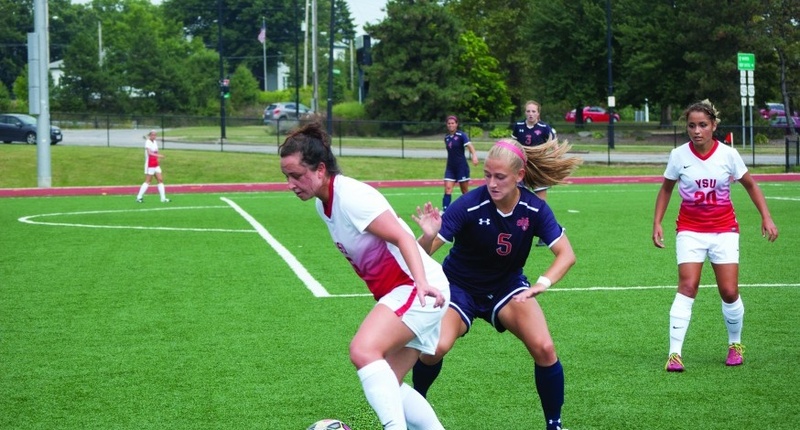 Youngstown State University’s Kathy Baquero (5) scored the Penguins’ go-ahead goal during the team’s 2-1 win over St. Bonaventure University on Sunday. Baquero’s goal was the first of the year, but she led the team in scoring last season. 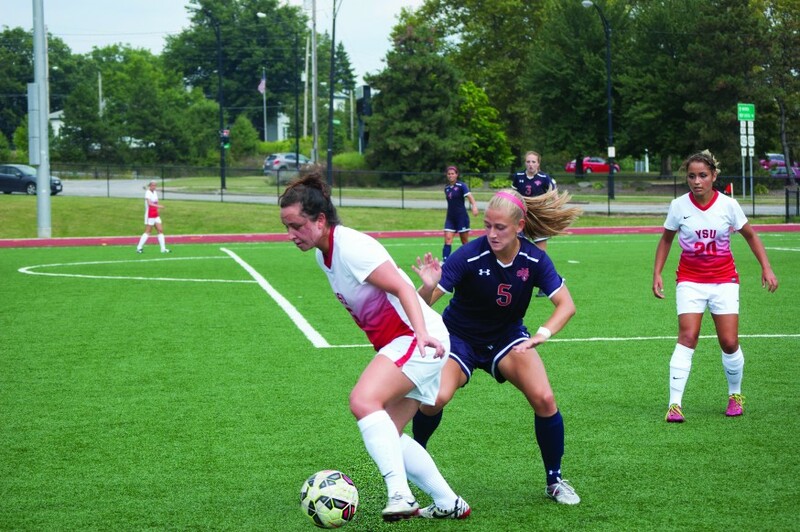 The Youngstown State University soccer team played its last non-conference game of the season on Sunday afternoon versus the St. Bonaventure University Bonnies. A pair of goals after the 30-minute mark from junior midfielder Kathy Baquero and sophomore midfielder Kyler Lum would be all the Penguins needed in a 2-1 win. With just over 10 minutes left to play in the first half, Baquero converted on an assist from defender Sarah Staley to give YSU (5-5) a 1-0 advantage. During the 51st minute of the match, Lum scored her second goal in as many games off of an Abby Kenski assist to increase the lead to 2-0. Nearly 10 minutes later, St. Bonaventure (3-4-2) scored after forward Lauren Hill recorded her fourth goal of the season — freshman forward Jessica Scruggs was credited with an assist. Lum led the Penguins in the stats column with four shots, two on goal. Baquero registered two shots, one on goal. St. Bonaventure was led in the stats column by Hill, who recorded seven shots, three on target. Scruggs and senior forward Abby Maiello each took two shots. The Bonnies took 17 total shots in the contest, seven on goal. YSU goalkeeper Elizabeth Balgoyen recorded six saves in the game, while St. Bonaventure goalkeeper Christina Sarokon made three. After the contest, YSU head coach Will Lemke offered his thoughts on the victory. The Penguins were more aggressive in Sunday’s contest. Lemke said the team needed to be better offensively to get a win against St. Bonaventure. Lum talked about how Sunday’s match would get the team ready for Valparaiso University this weekend.